Snorkeling is the first step to get to know the beautiful underwater life without the risks and difficulties of diving. 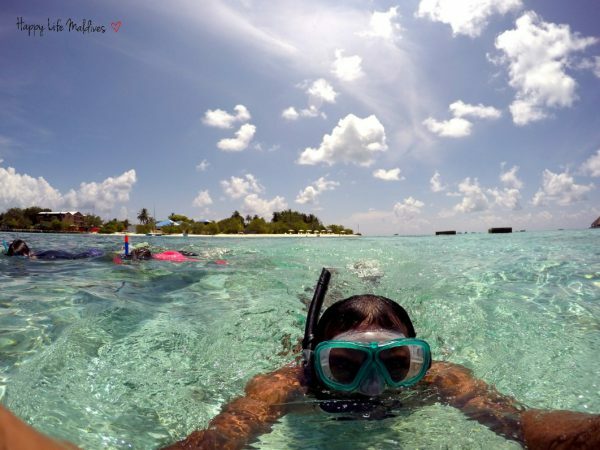 The Maldives offer you the perfect snorkel opportunity. Most islands are surrounded by a sand-bottomed lagoon, and then by a reef (faru), which is a belt of living and dead coral. The water there is mostly shallow where light can be absorbed the best. That means that the color variety of what you will see will be much better than in deeper water where the light is not absorbed as well. You will enter a different world! 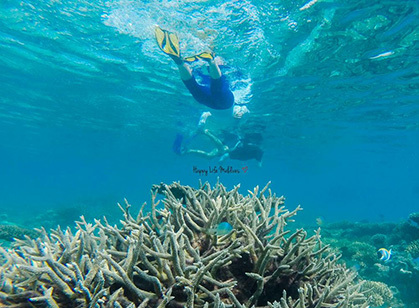 You can always put on your goggles and fins and go on an adventure around the island and snorkel the house reef, If you are hungry for more just book one of our boat snorkel excursions! 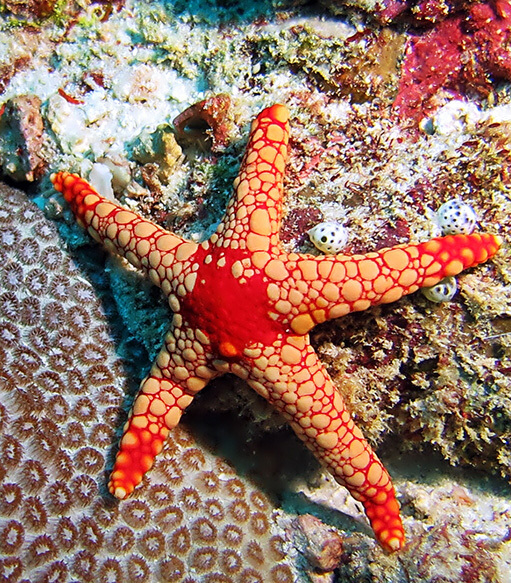 Snorkel Adventure The 15 minute boat ride will take you to beautiful coral and sea life. The water depth will be around 2 to 4 meters and if you are lucky you may spot a manta ray or two. 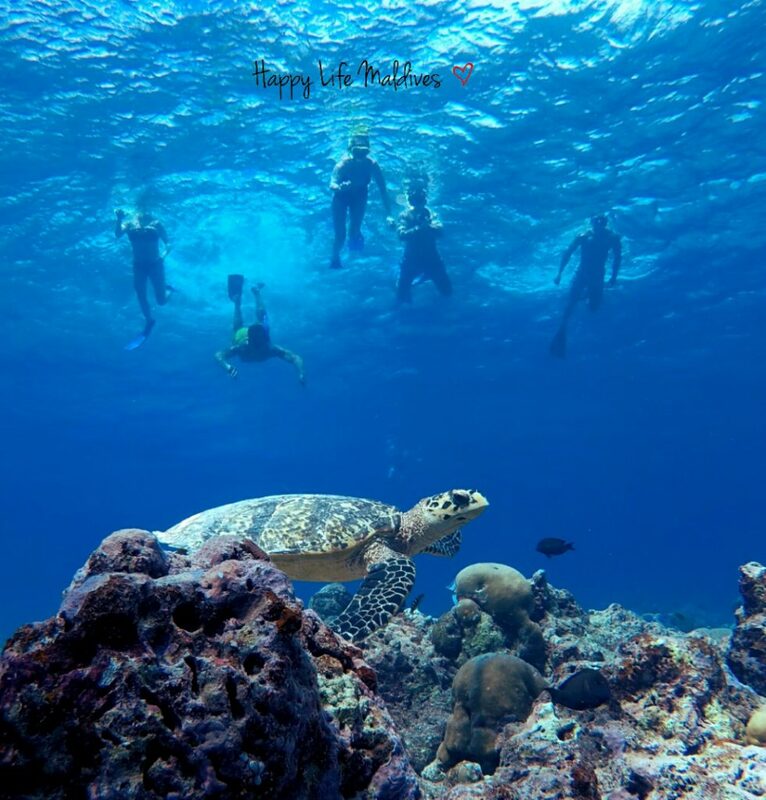 Outer ocean reef snorkeling – Snorkel Safari This excursion will take you on a 30 minute boat ride behind the faru (reef) closer to the open ocean. Water depth will be from 3 to 6 meters, where visibility is still perfect. Be captivated by the gracefulness of the turtles and the elegance of the manta rays. Sometimes you can also spot reef sharks and moray eels and that is beside all the other big fish. Our guide will be with you and make sure that this excursion will create happy memories.